Chancellor Angela Merkel has been dominating the German – and European – political landscape for over a decade. But after years of economic and refugee crises, unpopular decisions, and a growing divide between EU members, Merkel is facing opposition inside her country and across the Atlantic as well. With anti-establishment forces strong across Europe and a new leader in America, how will the German political landscape shape up this year? And with the new president in Germany standing against confrontation with Russia – should we be ready for a policy shift? We ask the former vice president of the OSCE Assembly, and former state secretary to Germany’s defense minister – Willy Wimmer. 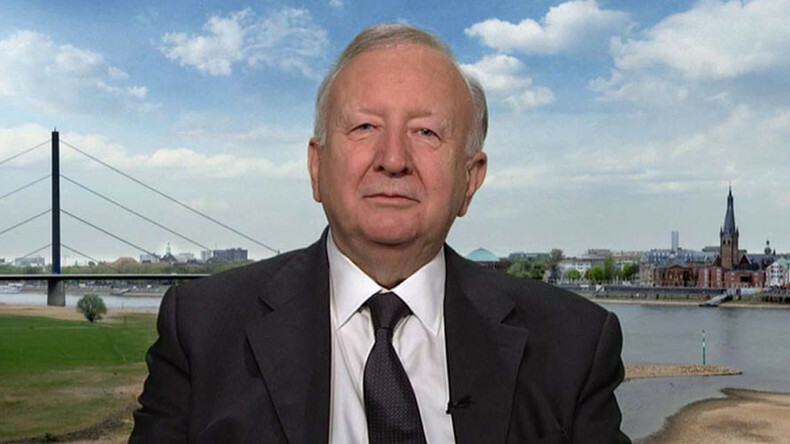 Sophie Shevardnadze: Willy Wimmer, former vice-head of OSCE Assembly, and former State Secretary to Germany's Defence Minister, welcome to the show, it's really great to have you with us. Now, The Federal election to determine the new Chancellor is coming up in September and Angela Merkel’s top contender Martin Schulz has promised to turn the vote into ‘a real thrill’, positioning himself as a ‘man of the people’. With Merkel already under attack for her immigration policies, is Schulz going to destroy her chances for a fourth term? Willy Wimmer: At least, we get an interesting situation in Germany, and it depends on, on one side, on the polls, which are very interesting in this moment, but on the other side it depends on three elections in Federal States, in March, and in May, in the Federal State of North Rhine-Westphalia, which is one of the most important Federal States in Germany. They will have the election in May, and I think, these three elections we face in Federal States will have a major influence on the situation in September. That's an inner German situation. There's another situation coming from our West European neighbors. We will have the first election in the Netherlands in March and then we will have presidential race in France, in May, and all these results will have a major effect on the inner German situation, because in the this very moment we all have the feeling, when it comes to Europe, that we live on a hand grenade. It can explode every second and this will have a major influence on the German elections in September. SS: Schulz is promising to focus on working people’s concerns, going after EU freeloaders like Hungary - is he taking a page out of Trump’s playbook in this campaign? WW: No, I think, when it comes to the inner situation in Germany and in the EU, we have to realise that as a result of the reforms of former Chancellor Gerhard Schröder, we face a very critical situation inside our own societies. The rich people are getting more rich, and the middle class and the poor people in Germany, they are getting poorer. Therefore, I think, we have a debate inside our own society about social justice, and those parties might succeed who take on these issues and Schulz is, perhaps, realising, that in the last 10-15 years, the Social-Democratic Party no longer was the party of social justice but of establishment, the rule of the rich. Therefore, it's normal to re-adjust the direction of the Social Democratic Party. SS: Berlin accuses Russia of interfering in German politics in a bid to influence the federal vote - even though intelligence services say they found no evidence of cyberattacks and misinformation spread by Russia. Is Russia just being used a tool in the election campaign? WW: I think, it is more than just using Russia as a tool. I think we have a disastrous situation in the EU, and we face, since some years, the situation where they do their utmost to create a hostile situation against Russian Federation, and when it comes to the press and when it comes to influencing population, they used, really, Moscow as a tool for their own purpose, and therefore, I think, it's so interesting that even the German Security Service - Bundesnachrichtendienst (BND) - just told the public that there's no influence by the Russian Federation which looks like a campaign of disinformation. So, I think, now they face, in Berlin or in Brussels, an interesting situation. Again, they have to deal with their own problems and not to use Moscow as an excuse. SS: Germany’s vice-chancellor and foreign minister Sigmar Gabriel, has said that Russia and the U.S. should find common ground - but not at the expense of Europe - what does he mean, what kind of damage would a U.S.-Russia rapprochement cause Europe? WW: There's an ongoing fear in Western Europe since decades. They fear two things: the first is to start a war and have a European battlefield and the second fear is to face something like U.S.-Russian condominium on Europe. When you mentioned, Gabriel, the second position might be important to him. This is an ongoing debate in Western Europe and we had it already at the time of the Cold War. SS: Germany’s foreign minister was the first to meet with America’s newly appointed secretary of State Rex Tillerson - after relations between Trump and Chancellor Merkel started off with a spat over the executive order travel ban. Will the foreign ministers be able to tame their bosses’ passions on this? WW: It is a quite unusual situation. Normally, German government or German Chancellors had excellent relations to U.S. President. WW: And I hope they will have excellent relations to Russian Presidents as well. But, this time, it is unbelievable. In the campaign in the U.S., we always had two camps and the German government had good relations to both of these camps. For the first time in modern German history, the Federal Chancellor in Berlin, Angela Merkel, had no relations at all to the camp of later President Trump, and therefore we face the situation in our own internal politics and our external politics as well, that we have difficult relations to the new U.S. government and this is not good for our relations with the U.S. and not good for our relations with other European countries. You see it already when it comes to our relationship with Great Britain. Yes, they celebrate a special relationship - and what is the result in Berlin? A hostile situation, and when you look back to the first telephone call between Angela Merkel and President Trump, it was shot before the outbreak of hostilities. That is not in our German interest. SS: Berlin came under fire from Trump’s administration, with trade adviser Peter Navarro attacking Germany’s export policy, calling the euro a disguised Deutsch Mark, and accusing Berlin of unfairly profiting from the undervalued currency. Will the White House be able to push Germany on this? Will Berlin cave - or go head-on into a trade war? WW: I think we have no interest in having a trade war with the U.S., and we already experienced similar situations in our history in the last 60-70 years, when we had big projects together with the Soviet Union, these projects were not in favor and not in the interests of the U.S., but nevertheless we did it - and therefore, when we hear these words coming across the Atlantic... yes, there might be critical situations, but we have to take our own national decisions on everything which has to do with our economical situation. We are better off as a result of German reforms in the field of economy than other European and international partners. We have to look for a fair situation for everybody, but the Americans can't blame Germans for doing better business than themselves. It's up to the international World Trade Organisation rules and the international rules on fair trade as such - and therefore, we have to deal with a fair situation not only between Washington and Brussels, or Washington and Berlin. That's the reality. SS: Berlin is saying it’s going to boost military spending - after Donald Trump lashed out against NATO states, including Germany, for not paying their fair share in the alliance - does Germany need to invest more in defence? WW: When it comes to the reality in Europe, we face a more critical situation. NATO is outdated, not only because of the remarks of President Trump that NATO is obsolete. NATO is outdated because the European Parliament, the European population never in history voted for NATO as an aggressive alliance. NATO was a defensive alliance and should be restricted on German territory as such. What we see in these days is NATO at the Russian-Western border. This was never in our interest and is never backed by international rules and regulations. NATO left the legal structure in 90s because of the illegal war against the Federal Republic of Yugoslavia. If President Trump wants to have a debate on the situation and the legal structure and the role of NATO as such - I think he is very much invited to do so, and it would be in favour of the European Union population. SS: Should Trump’s criticism of NATO be a wake-up call for Europe to start taking its own defence more seriously, and not just cling onto the Pentagon for its security? WW: When it comes to the European situation, I think we face a very interesting general situation when it comes to our neighbours. Since the end of the Cold War, we were happy to live in an environment where we only had friends on our borders. To the West and to the East and to the North and to the South. When we really continue with such a kind of a policy, it's not a question of how strong the European military will be, whether it's under control of the U.S. or whether it's under the control of the European Union. I think we have more things to do in Europe than just concentrating on the military. When we face today's situation and look on our neighbourhood, what happened since 1990s, with the war against Yugoslavia, we are in U.S.-led wars throughout the region between Afghanistan and Mali and we killed people by thousands and we are upset when they try to save their lives and come to us. That is the situation since '99 and therefore I think we missed the big opportunity we had, not only because of the end of the Cold War, but of the Charter of Paris of November 1990 where we all promised each other only to have peace in Europe. Therefore, I think, we have to go back to the Charter of Paris situation, and we can do it... I think, when Moscow and Washington will find the way to communicate in a better way than Obama and the Bush administration did it years ago - I think it depends on the U.S. how to organise a better policy in Europe compared to the situation we had in 1990s. Therefore, I think, we should not concentrate on building up NATO even more and on a global scale. We have to go back to our own interests and we have to deal, on one side, with Washington, and on the other side, with our Russian neighbours. SS: Many EU diplomats once again reiterated their support for keeping anti-Russian sanctions in place. At the same time, Trump hinted the U.S. could lift sanctions on Russia in exchange for good deals with President Putin. If Trump has his way, do you think the EU will have no choice but to follow suit? WW: When you look in the German population, when you look in the population of all countries which belong to the EU - people and the population at all, the don't have any kind of understanding of the sanctions. The sanctions are in place because of the coup-d'etat in Kiev which has been organised by the West. Why do we have sanctions against the Russian Federation? There's no reason. We hurt our relationship, we hurt our own interests, and we fit into the interests of others, on the other side of the Atlantic, who are very known to the public. I think, in the very moment, when President Trump will lift the sanctions against the Russian Federation, we will forget about sanctions in the EU, at that very moment. SS: There’s opposition to Russia tie-mending both in Brussels and in Washington. You’ve mentioned in a recent interview the “war establishment” of Washington that is trying to block Trump’s attempts to reconcile with Russia - and be in generally less hawkish than usual. Do you think this war establishment will triumph, and prevent Trump from doing what he wants? WW: It's what we see in this very moment in the U.S.. In my opinion, here's one target: not to see President Trump organising better relations - which are possible, and which are in our interests - with regard to the Russian Federation and with regard to President Putin. That is their main target, and I think it was outstanding, some days ago, when American president Trump accused his own Senators, from his own Republican party - senator McCain and senator Graham - to organise the outbreak of the WWIII. I think we never heard this before and this explains to the rest of the world what's going on in the U.S.: it's a battle about war and peace. Trump is peace and McCain is war - and these are the words of the U.S. President. SS: While Chancellor Merkel denounced Trump’s travel ban on majority-Muslim states, Bavaria’s leader Horst Seehofer praised Trump’s decisiveness, the Alternative for Germany party called it a model policy - are drastic measures like this effective? WW: I have some understanding of the rivalry between Berlin and Washington, but not in a way that I support the policy of Federal Chancellor Merkel. President Trump is very outspoken about having secure borders, and this is in the interests of the German people and this is in the interests of the European population as a whole. We are interested in having secure borders, no wars on the other side of the border and no refugees coming by hundred of thousands to our countries. We should help them to live in their own countries and not destroy and not destroy the future of these people. I think we are totally on the wrong side of history when it comes to the Western policy over the last 25 years. Therefore, we have to re-organise almost everything and the reason why Merkel is so hostile against President Trump is because she is a spearhead of the policy of Obama, McCain, Soros and others when it comes to our relation with the Russian Federation. That is the reason behind everything, we have to realise in Western Europe. SS: Germany has experienced terrorism first-hand with the Berlin Christmas market attack. However, calls from the country’s interior minister to centralise Germany’s security structure have been met with criticism - why? Right now each of Germany’s 16 states has its own intelligence service - is that effective? WW: I think we have to deal with questions like that and we have to concentrate on an effective structure of our state, of the EU as a whole. But when the Federal Chancellor herself is not acting on the legal base when it comes to the migration development - she got rid of German and European laws in September of 2015. She didn't put in effectiveness into the German law, again, after this crisis which came from Budapest railway station. Now, our borders are open and that is the reason why we have all these troubles - not because the intelligence service or security service has no realistic structure in our own country. We have to go to the basis of all these problems we have, and this is a Federal Chancellor who's not acting on the basis of our own law. The PM of Bavaria called this government "a government acting on an unlawful situation" - and this expresses all. SS: One of the problems laid bare by the Berlin attack was the country’s inability to swiftly return migrants who don’t qualify for asylum - the attacker was a Tunisian migrant who was supposed to be deported, but Tunisia didn’t want him. Why is Berlin willing to compromise its security by allowing everybody in? WW: There's the great question in Germany and nobody has the answer to that because the Federal Chancellor, for two years, didn't explain her policy to the German population, and an outstanding and interesting situation in the German Parliament is that they didn't want her to be expressing her views in the Federal German Parliament. We live in a situation where we never lived in before - the German government has to be based on our own laws. When we allow the Federal Chancellor to do her own business, we are facing a critical situation and when it comes to hundreds of thousands of people of whom we don't know that they are in the country, of whom we don't know about their names, their background - I think we never saw, in modern European history, a country being organised like this and therefore, I think, when we face all these critical situations when it comes to Berlin and when it comes to 9/11, when it comes to the situation in Paris or in London or in Madrid - we have to blame our own governments for not obeying our own laws. Therefore we have all these security problems. SS: Alright. Mr. Wimmer, thank you very much for this interview, we were talking to Willy Wimmer, former State Secretary to Germany's Defense minister, former vice-President of the OSCE Assembly, discussing the continent's security issues and Germany's efforts to tackle them. That's it for this edition of SophieCo, I will see you next time.